Hello, everyone! More drafting today, but not garment deconstruction this time. Instead, we're simply going to meander through some of the subtleties in drafting. Drafting is simultaneously an exact science and a nebulous art. On one hand, it is systematic and linear: there are rules, standard sequences, tables, guidelines and even formulae to enable a person to go from body measurements to custom-fit garments. You can read books that teach you all about these. You can buy computer programs that digitize these, implying that it is possible to create algorithms from these formulae and sequences. You can send your vital statistics to a human pattern-maker who would plot these into a personal sloper, in spite of never actually having laid eyes on you. There are even standard fixes for patterns (with code names like FBA, SBA, Rounded Shoulders and Sway Back) to make them better fit your body. With these come the promise that because it can be objectively quantized, anyone and everyone- provided they have the patience to absorb the information and act on it - can draft. On the other hand, drafting is also completely subjective. Years after I first learned to draft and forgot and wanted to re-learn it again, I asked Mum to teach me. She responded, "We'd better ask Auntie Laura. She's much better." And when Auntie Laura turned up for my lesson and all three of us were hunched over our drafting table, arguing and scribbling lines all over our brown kraft paper, she mused, "If only your Grandma were still alive. She was very good, you know. The best. Only ever needed one fitting. One fitting and it was perfect! Imagine that." I couldn't. How was this possible, I wondered, when both Mum and Auntie Laura were taught by the same teacher - Grandma - and all of them experienced by the same number of years, using exactly the same methods and techniques? Did Grandma draw straighter lines or swooshier curves than everyone else? Was she privy to secret mnemonics that allowed her to supercalculate the width of a bust dart based on a person's bra size? Did she have a magic wand? Much later, when I was finally back on the road to semi-successful drafting and preparing that Sewing From Scratch tutorial series for you guys, I started to understand. There is a feel to drafting that cannot be quantized. It's similar to how some people know which colors go well with other colors in a room, or how other people can taste a pot of soup and know how to tweak it to get it to taste just right. Certainly there are principles that govern their decisions - concepts like coordinating vs. contrasting colors and warm colors vs. cool colors, and standards like stocks and roux(es) and base flavors and all the other things that a person can learn in art class, interior design courses or culinary school. But when all the theory has been assimilated, and we begin to apply ourselves, we finally realize how short a distance that theory actually takes us. If we are sufficiently analytical, we might transcend our frustration enough to ask the right questions that allow us to break through an impasse. Sometimes, just the questions are enough to redirect us to a new book, a different experiment, a second muslin. Maybe we will be lucky and someone will come along who can answer those questions and save us the time of shooting in the dark. I am lucky that Mum and Auntie Laura were available and interested in answering my early questions when I was learning to draft as a teenager. They had so much to teach and often it was too much, because I was still learning the basics (how and where to plot a dart, how and where to draw the shoulder slope). Everything was rules-of-thumb, black and white, yes and no. Fast forward to now, when drafting blocks is as normal as writing a grocery list, and I'm beginning to see nuances. Greys. Shades. Alternatives. Better-thans. Appropriate-fors. Choices. It is empowering, surely. But it also feels completely subconscious, natural, congruent. I know this because I don't think about how I draft until I need to talk about it in a tutorial. Then, what makes perfect sense to me and could therefore be trivially explained in a single sentence ends up requiring three posts, usually with numerous diagrams, because each time I peel back a layer, there is some other principle underlying it, which needs to be first unpacked to something else even more fundamental. My reaction is usually, "Wow. That took too long to say for something that everyone should know." And then I have a headache and have to eat chocolate to get rid of it. I think of those Somethings That Everyone Should Know as the subtleties of drafting. These are things that drafting books may not cover because they are either "obvious" (to which we roll our eyes, mouthing, "As if,") or something the authors hope you'll figure out for yourself after, say, 10 years of drafting experience. Or maybe they are troublesome to write about because there is no easy formula for them. Or they don't have a specific name. Or because they are incidental to the main focus of drafting, which is to produce a pattern for a garment, period. 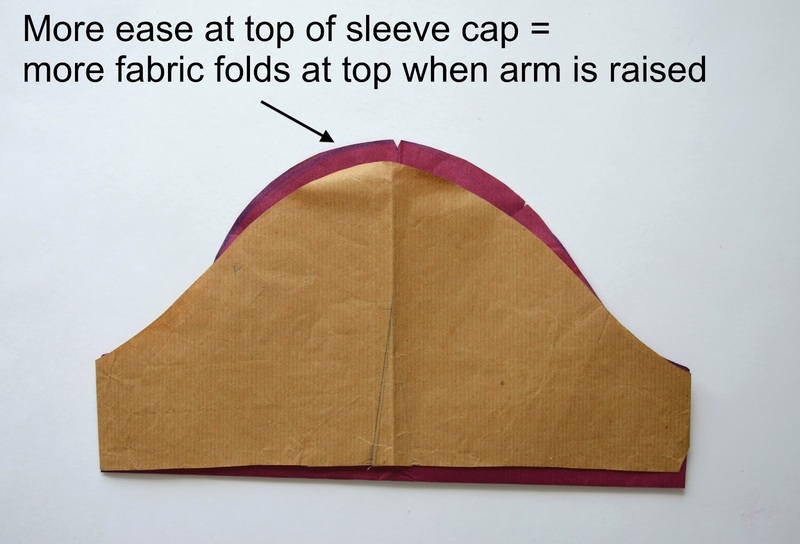 What shape of sleeve cap to choose for a particular fabric. What length of sleeve to choose for a particular figure type. Where to position the seam on a sleeve, a skirt, a shirt. Where and what kind of dart to use for which part of the garment for which kind of fabric for which body type. Does the method of shaping (seams vs. darts vs. combination) matter for the kind of garment or muscle tone or body shape of a person? No formulae, code names or standard treatments for those, huh? The most frustrating thing for a drafting student (at any level) is not so much what we don't know, but what we didn't realize we don't know. Until someone comes along and offers a counter-suggestion, plus its theoretical principle, and something clicks and we get one of those lovely eureka moments. It's a frightfully overambitious goal but that's what I am going to attempt in the next couple of posts. 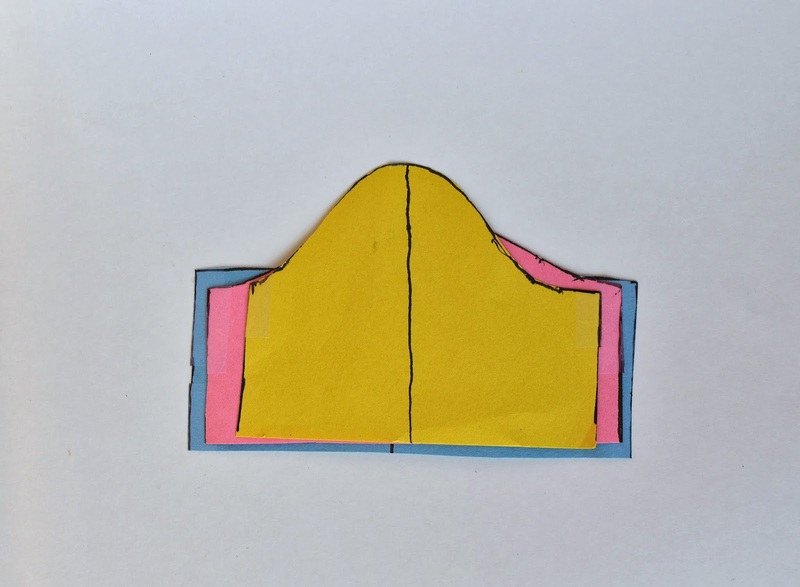 Rather than share how to draft a woman's sloper from scratch (really, just buy a drafting book, friends, if you are serious about learning), I'm going to try to talk about the whys. Completely bonkers, I know. So, before I chicken out, let's do sleeves today. I raise my eyebrow but otherwise make no movement or sound. You continue, "Regardless of whether I use a commercial pattern or draft them myself, they are never comfortable and they never fit properly and I. Just. Don't. Know. What. Or. Where. The. Problem. Is. And the worst thing is that up till recently, I wasn't even aware that they were bad. But one day I woke up and realized I had Stinky Sleeves. How, I don't know." And, as a visual aid to your frustration, you smash your fist into one of the scones. It is a good self-disclosure story with some how-tos for your quick-fix pleasure, and I am tempted to share it with you to make you feel better. But we must delve much deeper than that, and peel back several more layers to where things are more fundamental so that we have something solid on which to build something good. "Did I ever show you the armscye and the Kleenex box?" I say finally. You stare at me as if I am either sadistically inattentive or utterly insane. I ignore your stunned expression. It is, after all, not the first time people have given me that look. Besides, yours was a good question (even if you may not have been sufficiently aware of it to yet give it words. I rub my hands together in glee. Let's start peeling back the layers! as small as possible while still allowing free movement of the arm. If you can make it smaller while your arm still moves freely, do it. as closely-fitted to your body as possible. 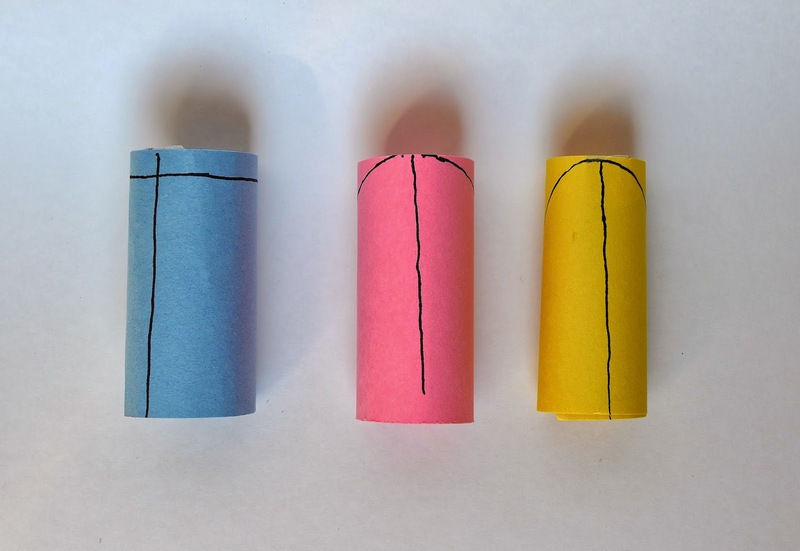 Use darts if necessary to wrap it more snugly against your body. The principle is this: a snug armhole stays more stationary against the body while its sleeve (where present and attached) is moving. 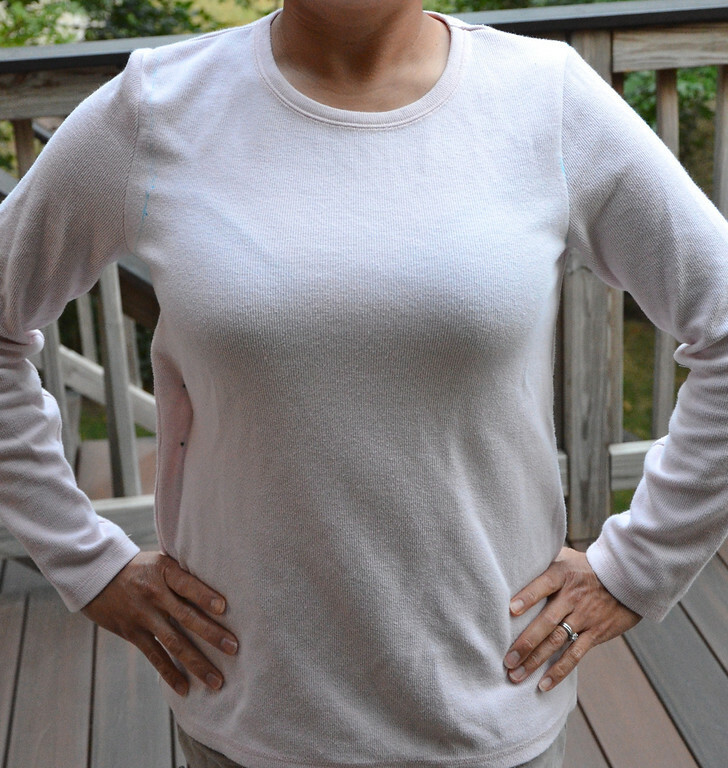 A loose armhole moves along with the sleeve while it is moving. This results in pulls, shifts and tugs. Which feel uncomfortable. Which makes it seem as if something is fitting poorly but is too vague to be immediately obvious. When you draft an armscye, and you are yet not confident in dart placement, do the best armscye you can and then sew a muslin and make corrections on it. Or unpick the offending sleeve of an existing garment - it is almost guaranteed that the armscye will be too large - and make corrections on it. The first part of the armscye on which to improve is the shoulder seam. Many RTW garments and patterns are made to fit shoulders that are differently-sloped than yours. The next part - which is the part that produces the most significant results - is immediately to the side of the bust. This is where the armhole is most likely to gape, because the bust pushes the fabric forwards and away from the body. You know this because in children (who have no bust) the armhole never gapes in that way. To correct the gape, make a dart. The more well-endowed you are, the deeper the dart you need to make. When you make a dart, the bottom of the armscye gets raised a bit. This could be a fortuitous side-effect if your armhole is also too large. The next part of the armhole to fit is the back. If your shoulders roll forward, so that your back is mounded (like a large, flat bust), the armhole might also gape in the back the way it did in the front, albeit to a lesser extent. Find out where it gapes and make a dart there. It will be a very small, skinny dart, if at all. Most people do not need this. The last part of the armhole to correct is the bottom (i.e. at the garment's side seam). If, after adding darts and perfecting the shoulder slope, the armhole still hangs too low, you will need to raise its bottom curve. Just make it higher in your draft. Period. Obviously if this is an existing garment rather than a draft, a too-low armhole cannot be altered because there isn't fabric to add to its bottom. However, sometimes, the side seams are too far out (i.e. the whole garment is overall too large) and when taken in, they naturally raise the armhole's bottom as well. If so, yay. If not, it is tragic but, as is, that garment cannot be saved. My mother always advised that if we are not sure how large the armhole should be, we should always draft and cut it smaller at first, because we can always enlarge it later if need be, not the other way around. But not as small as this - unless you are planning to make a mannequin. 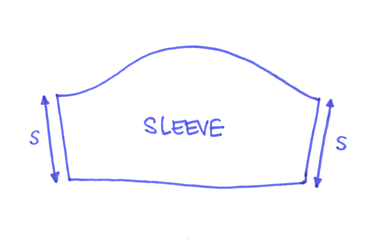 Just so we're all on the same page, let's first look at the anatomy of a sleeve and define some terms. The shaded blue portion is the sleeve cap. W = width of sleeve cap. Anatomically, W is also a measurement of the bicep. The dotted vertical line divides the sleeve into the parts that are set into the front armscye and the back armscye, respectively. 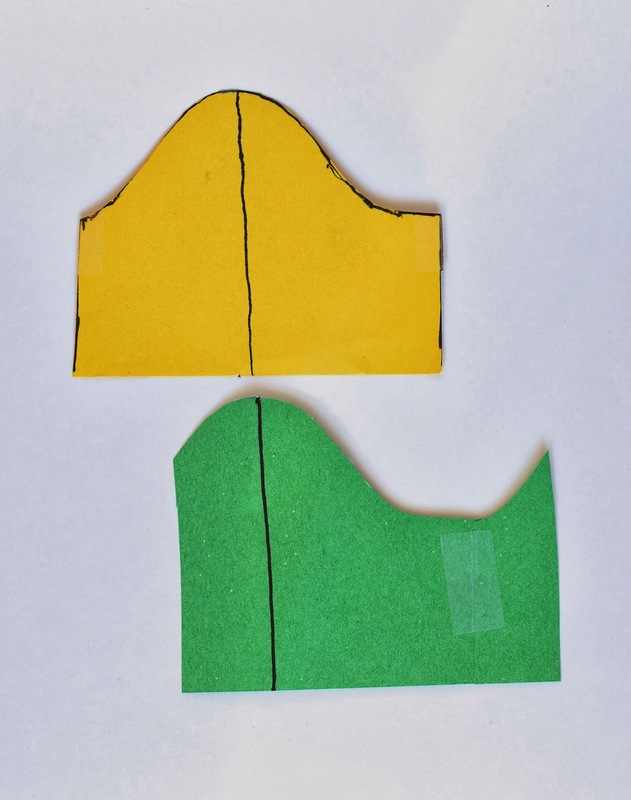 The widths of these two parts, Wf and Wb, may or may not be the same, depending on the shape of one's shoulder/bicep. S = the shoulder point, where the sleeve intersects the shoulder seam. I first saw this next box-and-tube visual aid as sketches on a website some time ago. I now cannot remember where that was so if anyone recognizes it, and can send me the link, I will be happy to acknowledge it. (updated July 21, 2014) I found it! Whoo! Thank you, Ben, for writing to me with your link to your brilliant concept. This is a box that represents the bodice of a garment. That oval hole is an armhole. We are going to make three different sleeves and set them into that armhole. 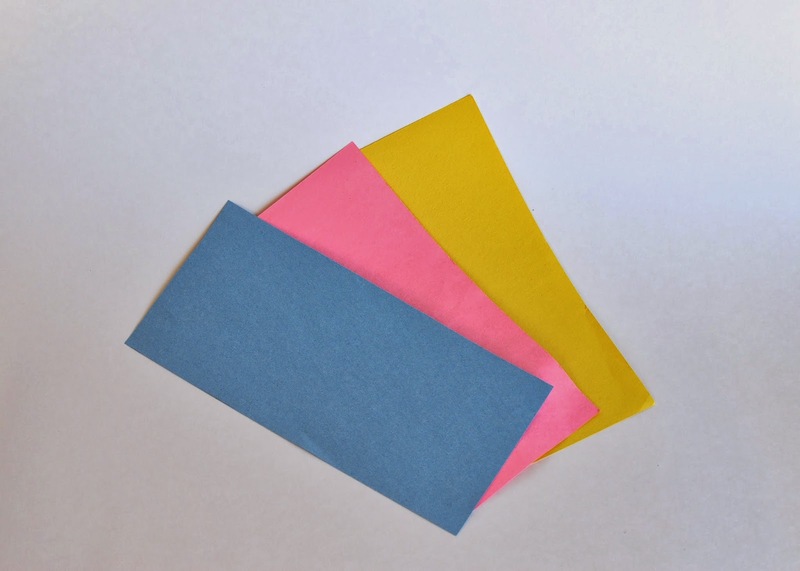 We will use different colored paper. Sleeve #1 is a horizontal sleeve. 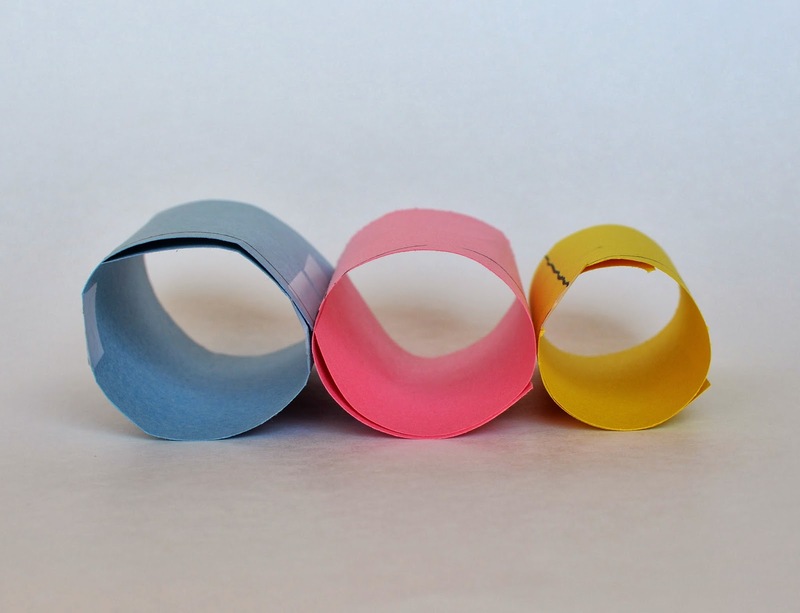 The paper is rolled into a tube whose circumference fits the armhole. Garments whose sleeves are set in at this angle include kimonos, kaftans, dolman-sleeved garments and some relaxed-fit Tshirts (especially men's). 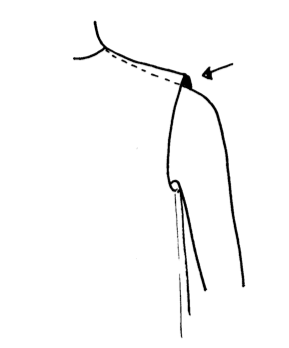 A line is drawn to indicate where the top of the sleeve (ostensibly its midline) meets the shoulder seam. Sleeve #2 is set in at a slight angle. Garments that have sleeves like these include most natural-fit garments like Tshirts, blouses and shirts, particularly short-sleeved garments. The paper is rolled to the diameter that allows it to exactly match the armhole at this angle. Again, the midline is marked. 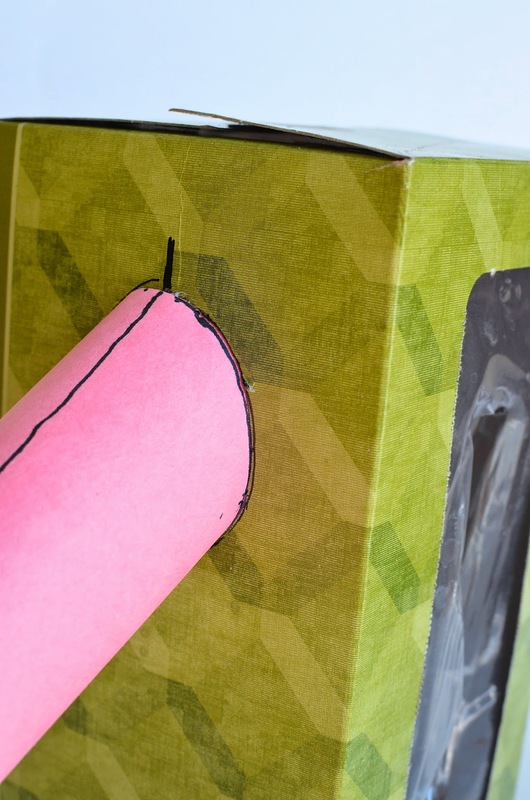 Another line is drawn around the tube/sleeve where it touches the box/armhole. Sleeve #3 is set into the armhole at a much steeper downward angle. Garments with sleeves like these include jackets and coats, and some other long-sleeved garments, in which the arms of the wearer are expected to more often hang down at his/her sides than animatedly move about. Again, the paper is rolled to the diameter that allows it to match the armhole and the midline, as well as the intersection of the sleeve and the armhole, is marked. Here are those three sleeves, with their various angles of set. Note that it is the same armhole into which they are all set. Now, we detach them and line them up. Do you see? Their diameters are different. In order for the sleeve to match that same armhole at different angles, the circumference had to change to compensate for that obliqueness. Next, we cut them open along their bottom "seam". The circumference has now become the "width of the sleeve cap". And all three sleeve caps therefore have different widths. Again, when superimposed, you can see the differences in the widths of the sleeve caps. Also, you can see the differences in the shape of the sleeve cap. Principle: The greater the angle of set (i.e. how downwardly slanty the sleeve is), the narrower and higher the sleeve cap. Depending on what kind of garment you are making, the sleeve may hang at a different angle of set. Often, the more casual the garment, the more movement is expected by the arms when wearing it, and therefore the closer-to-horizontally will the sleeves be set. The more slanty the sleeve, the narrower the sleeve cap gets. Therefore a more slanty sleeve is also less comfortable. This means you can choose, for the same armhole, the angle of set for your sleeve according to the function of your garment. If you are making a button-down shirt but you know you're going to move your arms around a lot (e.g. if you are a teacher or presenter and have to write on whiteboards etc. ), you might want to deliberately draft a wider, flatter sleeve cap. It also means you can choose, for the same armhole, the angle of set for your sleeve according to your body shape. If you have chunkier upper arms and shoulders, you can deliberately draft a wider, flatter sleeve cap because it translates to simultaneously having a wider circumference, which therefore will be more roomy. The length of the sleeve cap (the curved distance) = the circumference of the armscye. But you'd be surprised by how many people don't seem to believe this, based on how they try to cram into an armhole a sleeve cap that is too wide or too narrow, resulting in hideous gathers on the shoulder or sleeve itself. But what about "sleeve cap ease"? You ask. Everyone wants their sleeve caps not to be tight and constricting. The cure, they decide, is to add ease, whatever that means. Some people do it by deliberately drafting a longer sleeve cap curve (e.g. 16.5") than can fit into the armhole (e.g. 15.75" circumference). Then they gather the top of the sleeve cap into a slight puff in order to cram that extra 0.75" into the armhole. Now, unless they were honestly originally planning to draft a puff sleeve, this is cheating. The more effective (and less duplicitous) way to introduce sleeve cap ease is to change the shape of the sleeve cap in order to accommodate your particular arm and movement. We will cover that below, after Secret #2. 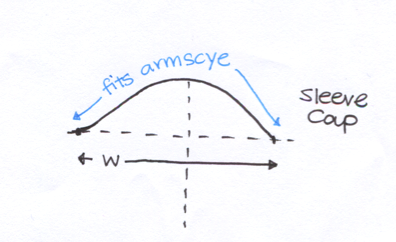 The curves in the sleeve cap and in the armscye are actually meaningful and related! 1 The shape of the sleeve cap corresponds to the shape of the armscye. Specifically, the inflection points (those blue and red dots) on either side of the sleeve's center line match up with those on the armscyes. If you are drafting free-hand, it is as simple as how far from the shoulder point those red and blue dots occur on the armscye, and curving your sleeve cap at the equivalent locations. As long as you keep the curved distance of your sleeve cap constant (so that it will still fit into your armhole), you are free to change the shape of that curve. This means you can make it flatter or pointier, curvier at different places than others, and whatever else you think will help that sleeve cap better fit your particular shoulder and upper arm. 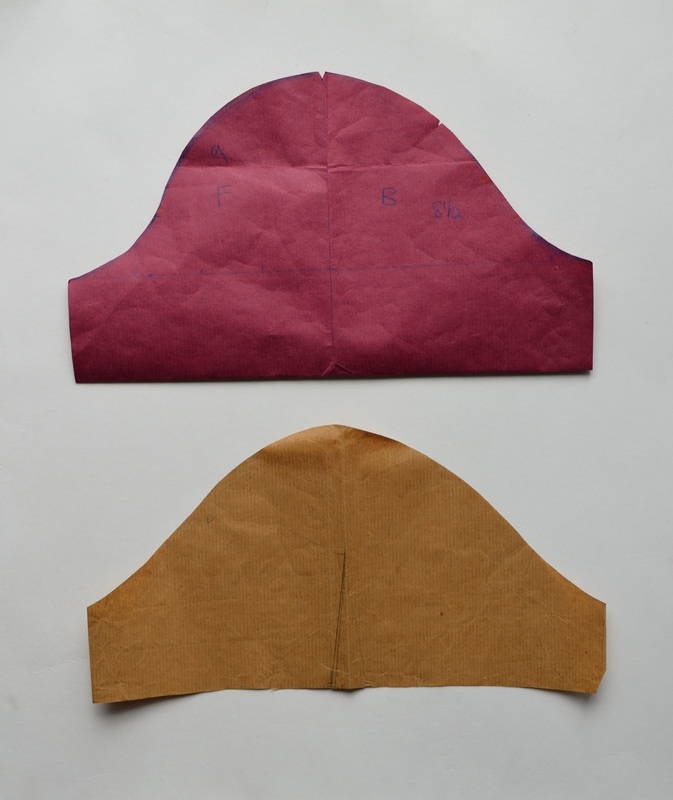 Here is an extract from this earlier post, showing two different sleeve cap shapes for the same armhole. The red sleeve cap is higher, pointier and more shapely than the brown one. This sleeve cap is too high for my shoulder shape- the fabric peaks in a fold at the shoulder. which means that while the overall sleeve might not look quite as sleek near the armpit, it is a lot more comfortable when the arm is raised. (i) When working with stretchy fabric (like knit), choose a sleeve cap that is pointier, like the red one above. The fabric will pool less at the armpit and the sleeve will look more sleek while still maintaining its freedom of movement (because it stretches). (ii) When working with fabric with less give (like quilting cotton), choose a sleeve cap that is flatter and less shapely, like the brown one. The fabric will pull less at the armpit during arm movement. (iii) For a garment in which you don't plan to move your arms very much (e.g. a jacket or coat), pick a sleeve with a pointier sleeve cap. 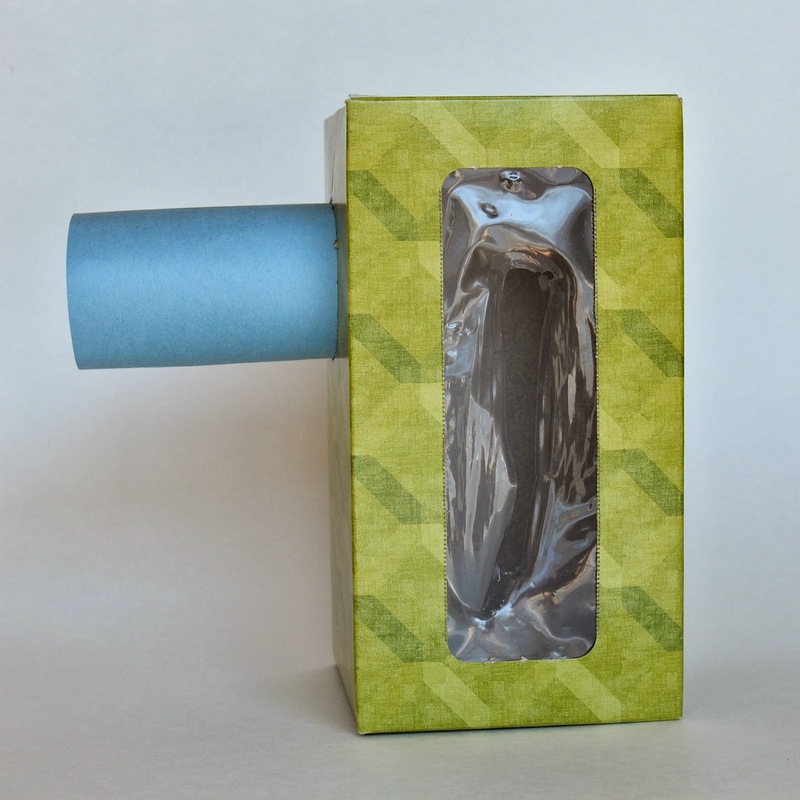 It will result in a more vertically-hanging sleeve (remember the Kleenex Box Illustration? ), with a more streamlined armpit area. (iv) For a garment in which you plan to move your arms a lot (e.g. an everyday shirt or Tshirt), pick a sleeve with a flatter sleeve cap. It will allow more freedom of movement. 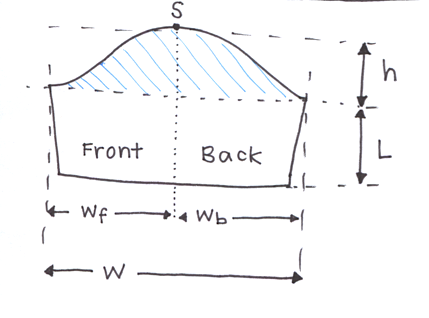 the overall seam pattern of the garment. Some shirts and coats have back yokes and the sleeve seam is deliberately situated at the back to form a continuous line with that yoke. sleeve shaping. Sometimes, the sleeve is not meant to hang straight down, but with a bend in the elbow. This is not uncommon in costumes in which the sleeves are very fitted and, for comfort, drafted to allow the arms to rest in a more natural, not-totally-straight-all-the-time position in them. In such cases, there may be more than one seam in the sleeve, plus elbow darts. The important thing to note is that, regardless of the shape of the sleeve draft, it is still the same sleeve- it has a sleeve cap and some rudimentary symmetry about the shoulder point. 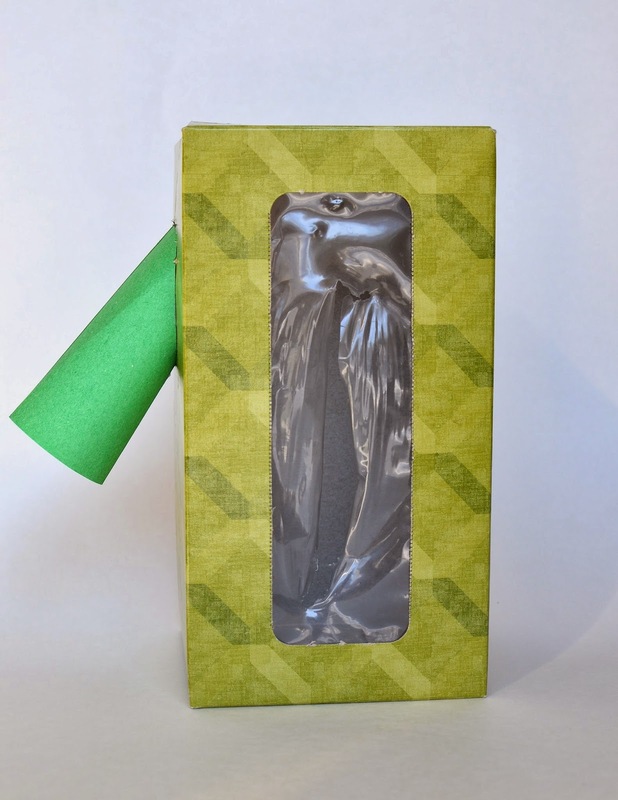 Here's an illustration, using our old friend, The Kleenex Box, with a green paper sleeve, set at a random angle. This is where the seam commonly is in many garments - at the bottom. If we were to cut the sleeve apart here, it would look exactly like a regular sleeve draft. This is what it would look like (in green). The yellow sleeve is the "regular" sleeve with the seam at the bottom, at the armpit. Which, if we were to cut apart and re-assemble like a jigsaw puzzle, will easily revert to the more normal-looking draft. The only rule is that the side seams (S) must be identical in length so that, when sewn together, they will match up. These variations are a staple in all drafting books. Jen covered that in her post in our previous drafting series, and I will link to that here. Note that throughout this post, we concentrated on drafting a set-in sleeve without gathers (i.e. we avoided puff sleeves). This is so we could focus on getting the sleeve caps to properly fit armholes and biceps and shoulders without superfluous ease. Many, many ready-to-wear garments have puff sleeves because those are an easy way to introduce more room in the sleeve cap area for a wider range of arm shapes. Many sewing patterns also employ puffed sleeves because they more easily accommodate different arms and compensate for the inability to draft to fit. By that, I don't mean that those pattern designers have inferior drafting skills; I mean that it is near impossible to custom-draft a beautiful sleeve cap for the arbitrary range of bodies that will wear their patterns. End of sleeve lesson! I hope this has been helpful. Sleeves and armholes are soooooooo important in that they can make or break a garment, and yet, beyond "Personalize Your Garment -Magically Make 100 Different Sleeves From The Same Pattern!" I have seen very little on how to actually look and feel good in those sleeves. 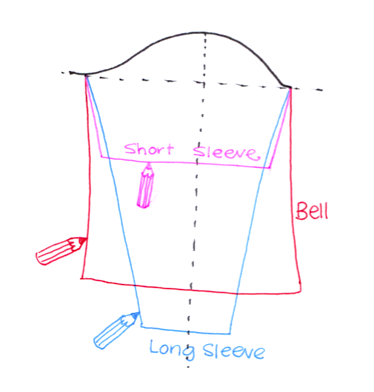 Perhaps this return to the fundamentals of sleeve theory will help you make better-looking and more comfortable garments in the future. Good luck! Thank you for such a great post. Incredibly straight forward and informative. I just finished my second muslin on a fitted shirt and this post is like a revelation. I have a decent fitting sleeve but I may be able to tweak it and make it even better now. Wow, I concur with all comments. Excellent post. Thank you so much!! This is fabulous! And fascinating. The Kleenex box visual aid is so helpful. I have trouble with sleeves, which is why I gravitate towards kimono sleeves a lot of the time. The info about sleeve angle is especially helpful. Thank you so much! I have, unfortunately, no relatives who sew. Your lessons are wonderful! I just want to say thank you, thank you, thank you! As silly as the tissue box demonstration is, it really paints a very clear picture! This post is awesome and I feel like I've learned a lot! You are a well of information on drafting, and thank you so much for sharing it with us! LOVE love love the kleenex box demonstration! Brilliant! very very very interesting. I have fat biceps and sleeves often did not fit me. Now I have a few things I could do depending on what I want out of it. It also explains why a sleeve I recently copied from a book for a woven blouse (with a flattish curve) still works for me even though its nothing like the shape of the knit sleeve cap I use in my knit tops (with a much steeper curve) and yet both seemed OK in wear. That's really useful. I kind of understand this but need a bit of practise with it. Wow! This is a great post! Thanks for sharing all this knowledge! Thank you very, very much. I'm so grateful you took the time and effort to explain this all so clearly! This will really help me. This was really fascinating. I have been using Alabama Chanin patterns without sleeves and have so badly wanted to add some, I might be able to try it now. I found, in making the Alabama Chanin garments that the sleeve holes were too small for my comfort, mainly because I wanted to be able to wear a t-shirt beneath it, but also because I cannot stand a restricting armhole. Would you say this problem is more the shape of the armscye or the size of it, or is it possibly both. I just made the armhole bigger with a little less fabric at the front where it was binding. Thank you so much for this post. I have been wondering for ages why some sleeves fit so poorly and why they either pull under the arm or puff at the shoulder seam. 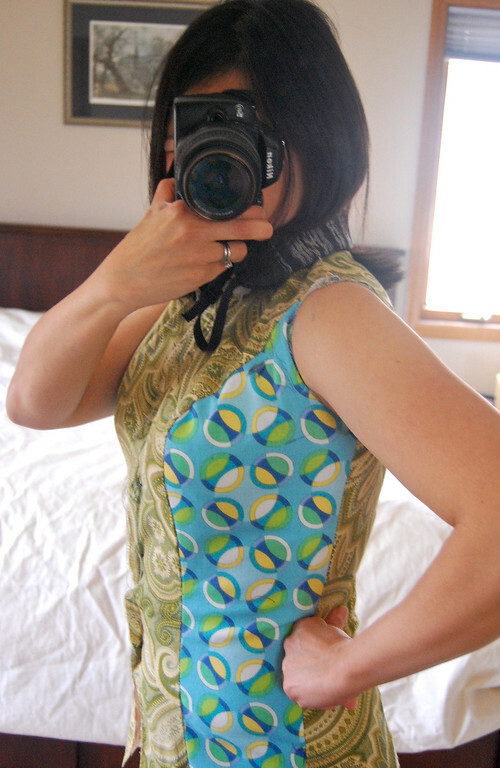 I typically sew from patterns rather than draft my own, bit I am often unhappy with the fit of the sleeves. Now I can try to re-draft my own. 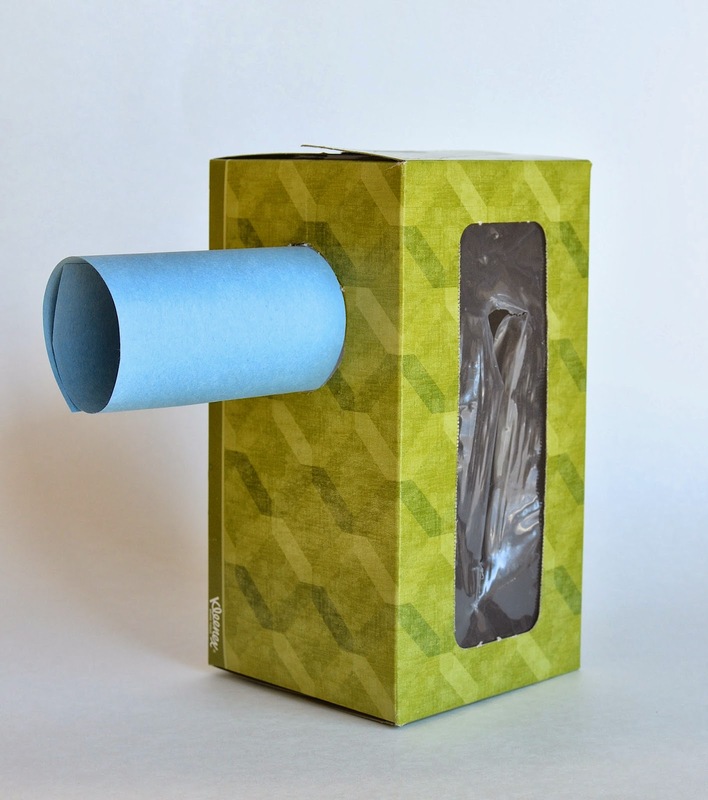 That tissue box was a fabulous demonstration; just what my mind needed to visualize everything. Thank you so much! So clear now. 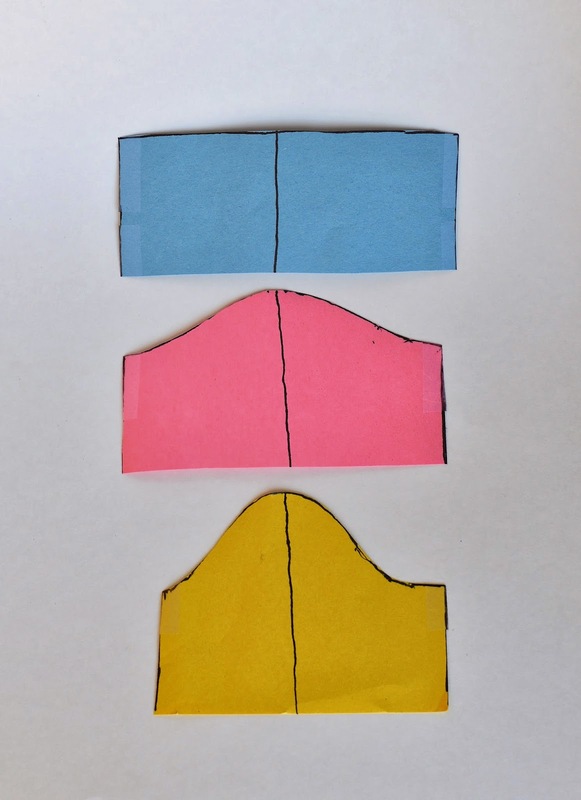 I think your explanation also relates to why we can get away with inserting sleeves flat when the sleeve shape is like the blue or pink examples but really should be set-in for the yellow example as the seams mirror the body best that way. Good point, Karen. Thank you. I hardly ever set in my sleeves the flat way, unless they are raglan sleeves or for doll clothes (small and fiddly). Habit, I guess. But yes, you're right. I think there is a name for that concept - dominant seams, I think. I have to go read that up to be sure I got the name right. I learned so much from this post, LiEr! I care a lot about how sleeves fit, and while I had figured out how to take in the shoulder seam I didn't know about the trick of adding a dart. I also didn't realize that you could alter a too-big shirt to make it fit the way you described her. Thank you for all of the drawings - they were very helpful for this visual learner! oh my god. revelations! Thank you! Thank you thank you thank you for taking time to do all this. I love trying to wrap my head around what you know and I love the aha moments that you give me every time you post. This was an excellent lesson, and much needed. Understanding the reasons and the science really helps out when drafting. I have never been happy with the sleeves I have made, now I know why. Thank you for the time you spend educating us ! 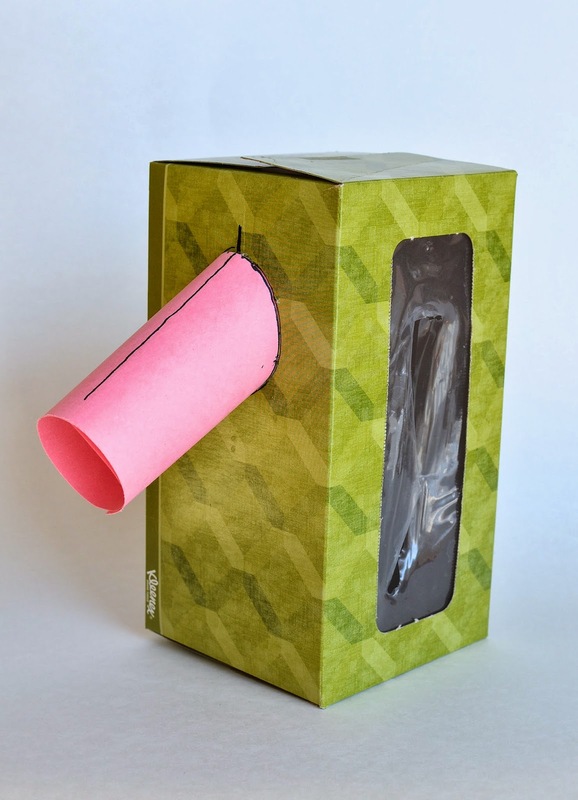 Wow, this is a fabulous post and the tissue box example clearly shows exactly what happens. I love it. I have learned so much. Thanks for soooo much information and the time it took to write. I'm going to echo everyone and say a big thank you for taking the time to write this post. I read this over the dinner and the sewing nerd in me was thoroughly fascinated. Thank you so much for taking the time to explain this, this answers so many of my questions! 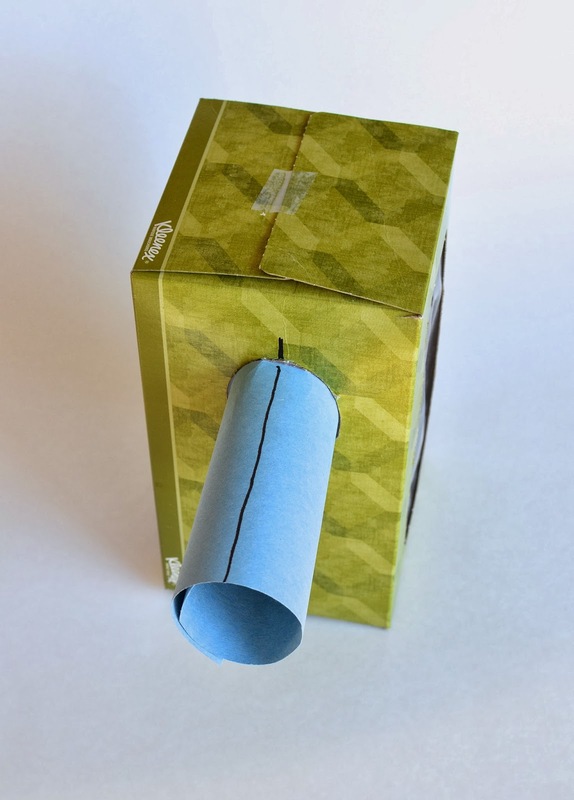 Your kleenex box model really hit home and I finally understand why some sleeve patterns work for me and why others don't! You are a brilliant sewing teacher! What a lot of great information! Thanks!! Great post! Thank you. 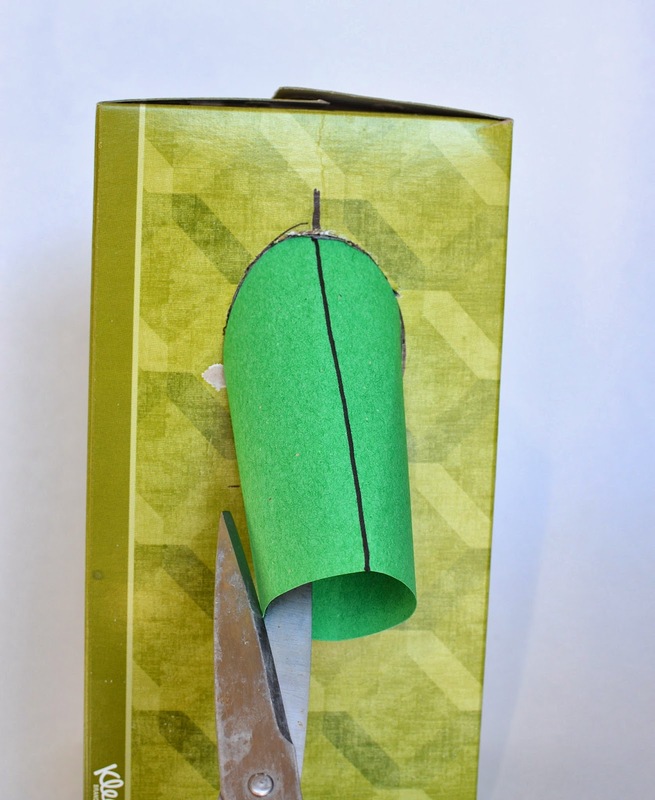 I have one question - would you incorporate the dart in the armscye into your paper pattern, or sew one in the garment itself? Definitely incorporate the dart in the armscye. There is no guarantee that you can insert a bust dart into an already-sewn armscye without reducing the size (and skewing the shape) of the armscye in a way that you don't want. However, if you happen to have a huge armscye already, you'll have some freedom/room to insert darts and fortuitously shrink the armscye in the process - a win-win situation. Thanks for answering my question, I'm afraid I was a bit unclear though! I really meant to ask - would the pattern alteration to get rid of gape create an actual dart in the finished garment, or reduce fullness by just changing the shape of the armscye? I imagine you can solve it either way, but wondered if you had a recommendation. Thanks again! Ah, I think I'm beginning to understand. My suggestion would be to consider the shape of the bust. Not all B-cups, for instance, are equal, in other words. Some people's busts are perkier and some are more uh... widely distributed. Depending on the specific shape of the bust, you might either introduce a dart in the armscye, or a french dart in the side seam or reshape the armscye without a dart. I'd say that the perkier/more protruding/more well-endowed one is, the more one should gravitate towards an armscye dart rather than just raising the bottom edge of the armscye. Thank you so much for taking the time to share your knowledge. This is very helpful. I've read your posts for years and never once commented. I'm sorry (even my husband chastised me for this!). I've emailed you before and you were incredibly helpful while I attempted to draft a sloper for my daughter and got tripped up on the sleeves. Unfortunately, mommy-hood took me away from being able to complete that project, but I remember sewing up the muslim, knowing the sleeves were uncomfortable, but being at a loss as to how to go about fixing them. Thank you SO much for your help and for this post. It kind of makes my brain want to explode, but I'm sure as I mull over it the next few days something might start to filter down. ;) My problem is that I need a week sans-kids (I have five who are 7 and under--including 18mo old twins!) to concentrate, but I also need one there for fittings! ha! I wish I were your neighbor so I could bother you on a daily basis. Thank you again! 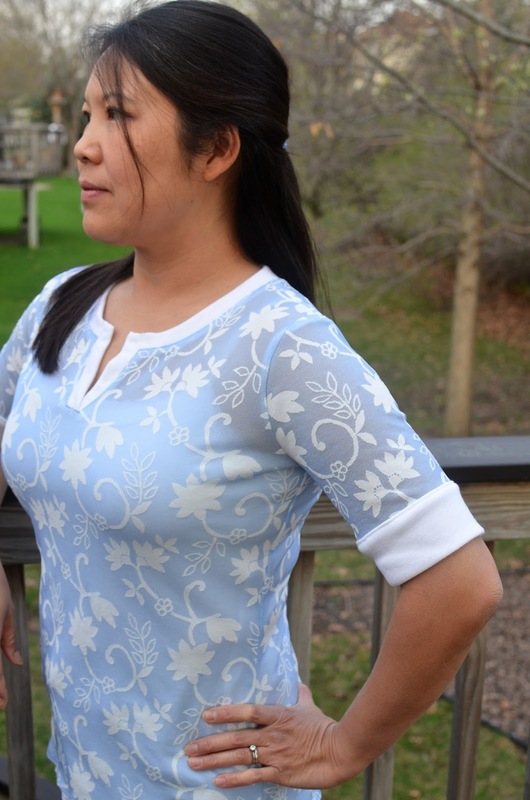 What pattern did you make the light blue dress that has the flowers and branches print? Thank you so much for this! I am supposed to be working, so I've only read half so far, but I'll be back because I've already had a significant 'ah-ha' moment! Can you please elucidate further - "When working with stretchy fabric (like knit), choose a sleeve cap that is pointier..." vs "For a garment in which you plan to move your arms a lot (e.g. an everyday shirt or Tshirt), pick a sleeve with a flatter sleeve cap." June: pointy. Knit fabric's stretchiness trumps function. In other words, you can stay stationary OR be animated in knit and your sleeves won't restrict you. BUT you can't be animated in a woven garment without your sleeves potentially protesting. *Grin* I recently drafted a t-shirt sleeve by draping it on myself (complicated maneuvering, that). I'm fairly pleased with the fit, but the resulting flat pattern sleeve shape is so... odd looking! It is indeed very pointy, and it also has a major scooping out of the forward side (plus very asymmetric from front to back). Thanks for boosting my confidence that I'm on the right track! Thank You!!! 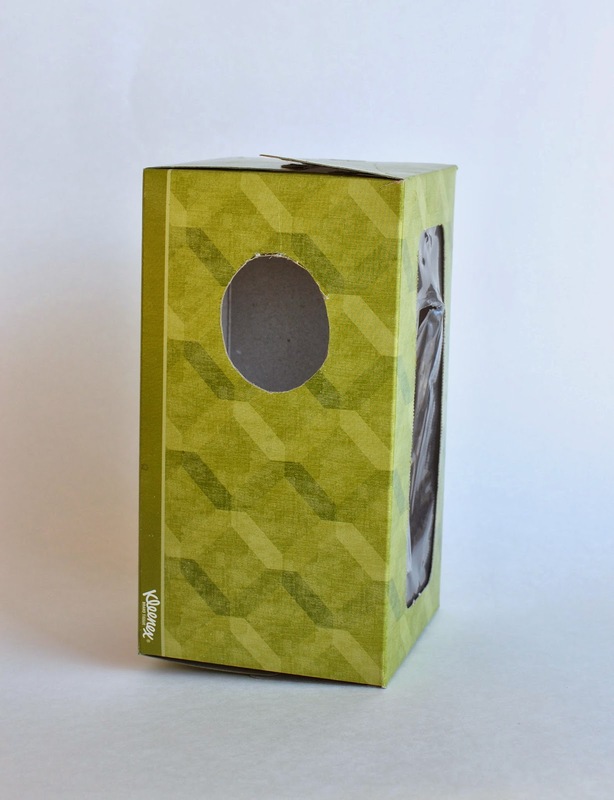 I am in the process of trying to create a sleeve pattern ...love the Kleenex box example...I get it now! Can I just say... I love you. You're the best. I, too, have stinky sleeves. Thank you! THANK you! It is so hard to find information about sleeves and sleeve caps. The kleenex box made me have a little moment of mind-blowing. I actually teared up at a couple of points as things became clear. That may seem like an overreaction but as you said, I've spent hours struggling with sleeves, knowing SOMETHING was wrong but not WHAT. And then when I worked out WHAT (armscye too low, sleeve too pointy) I didn't know how to fix that without creating five other problems. I will definitely be visiting this page quite frequently for sleeve assistance! Thankyou so much for this wonderful explanation of sleeve fitting, I have only just found your blog and I am sure I am going to learn lots from you. I really appreciate this post and all the work you put into creating it, looking forward to checking out the rest of your blog. Thank you so much for that detailed writeup on sleeves, I couldn't have understood it better ! and those examples at different angles, thank you again for that. I am confident if you compile all your writings, you could easily create the science of Tailoring or dress making, and i am already booking my copy today ! OMG--I've been altering sleeves for years without a really concise understanding (sewing lots of vintage patterns does that to a person--did no one raise their arms before 1960?). What I was doing worked pretty well, and I'd figured out the general principles, but this really linked everything together so now I understand *why* it works. Thank you so much! Wow, thank you for giving me an aha! sewing moment--I finally "get" it! Wow. You are fab at explaining! Thanks so much for this post! Question for clarification about ease...if my armsye measures 9" and my sleeve cap measures 9", do I need to add ease? The sleeve cap is lower and wider (like the casual shirt, the middle example.) My armsye fits well, I think. Sheila: What do you mean by "add ease"? If your armscye circumference and the sleeve cap distance match, any extra width you add to the sleeve cap will have to be crammed into that armhole somehow - either by pleats or gathers (i.e. you will have to make it a puff sleeve). The short answer is, "It depends on whether your sleeve cap fits your upper arm/shoulder comfortably or not. If not, either change the shape of the sleeve cap (while keeping its width still 9") or make it puff if you don't mind it." As I understand from books on the subject, the traditional way for drafting sleeves adds 1-2" (the ease I was referring to) to the sleeve cap to accommodate the shoulder ball shape - then you ease that extra fabric into the smaller armsye (like you said). I'm new at this - but,my sleeve draft (the 1st one I've ever done) resulted in an equal measurement of the armsye and the sleeve, and that results in a better look/fit in my muslin than the sleeve with the additional ease. But, I am hesitant to actually cut my fabric before I am sure I understand what I am doing. As I understand your comment, it's the shape of the sleeve cap and not additional inches of ease that makes it fit correctly. Am I understanding you correctly? Thanks so much for your help. Sheila: When I was growing up, my mother used to "add ease" to the amount of 1/2" to the sleeve cap in just the way you mentioned, to accommodate the shoulder. She'd ease it into the armscye without gathers (by hand-easing and basting, not gathering stitches or pinning) and it would definitely give more a more roomy fit. Done poorly, though, this "hand easing" would result in accidental gathers or asymmetrical positioning, and would look quite weird. I don't include any extra ease in my sleeve caps when I draft - they fit the armscye exactly. Thanks so much for your thorough explanation and the video. Both were very helpful...I am excited to move ahead with my project! Yeah!! I'll keep coming back to see what wonderful tips and encouragement you have to share! Thanks again! Thank you so much for the kleenex box illustration! I've drafted a wonderfully fitting bodice but for the life of me cannot draft a sleeve that is comfortable. You have motivated me to get back to work on it. I think maybe the most difficult part for me is not being sure that the armscye is located correctly on my body; i.e., too small or too large. Trial & error - here I go! Gail: If your armscye fits your body well, the battle is more than half-won. So you're on the right track! Don't give up! Wonderful article! So much information! Thanks for taking the time to put it all together. Definitely bookmarking this one! What a great, complete tutorial! I love your descriptions and the way you broke everything down to make it easy to understand. Pinning! This is an AMAZING post! 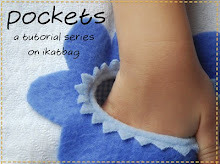 Thank you for sharing your knowledge, which I found via the Sewing Pattern review website. I have been at my wits end trying to find more info on sleeves all week and this is brilliant. Thank you again! wow - this will take me back to square one designing my ballroom competition gown bodices and sleeves, a task that I stumbled through and am fairly happy with. This info will make fitting sooooo much easier and better! Thanks to Pattern Review for sending me here! This is fabulous. Thank you very much! This is FABULOUS - thank you! THIS is the website I've been looking for all day! No one but no one had rendered a 3-D model paired with the actual shapes of the different sleeves. And I'm SURE they all had Kleenex boxes available, the lazy bastards! Ha, ha! Thanks so much, I can now make my freakin' jacket without stealing someone's Xanax. Thank you a million times! I've been making tank tops for months so I don't have to think about sleeves. Now I just want to try them again! This is incredible. 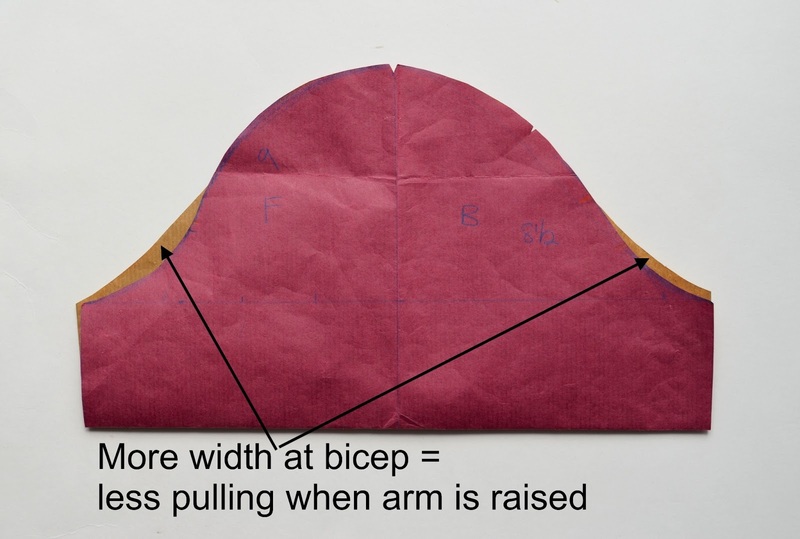 The information about how to fit larger biceps and choose a cap shape / height based on body type and fabric was a lifesaver for me, thank you SO much for writing all this up! Excellent post!! I wish I had read this before the sleeve drafting section of draping class. This is so interesting, I want to learn how to sew but I'm very intimidated. I want to be able to make excellent garments but that seem so far from me right now, I kind of get this a little bit and I'm sure if I was sewing anything I would get it more. Thank you for making it understood and not seem like gibberish. Thank you for the illustrations. I am more of a visual learner and this has helped me quite a lot. This is one of the best posts on sleeve drafting I've ever come across. Bookmarked! Thanks! Amazing post, I was always wondering how the two dimensional odd looking shape is matched up with an apparent circular armhole. Thanks for the example of the Box and paper !!! Thank you thank you thank you. I had a grasp of this stuff, but now I UNDERSTAND it! Wow! Thank you! This is fabulous information! It was shared on Face book by a friend and I am so going to do the same. 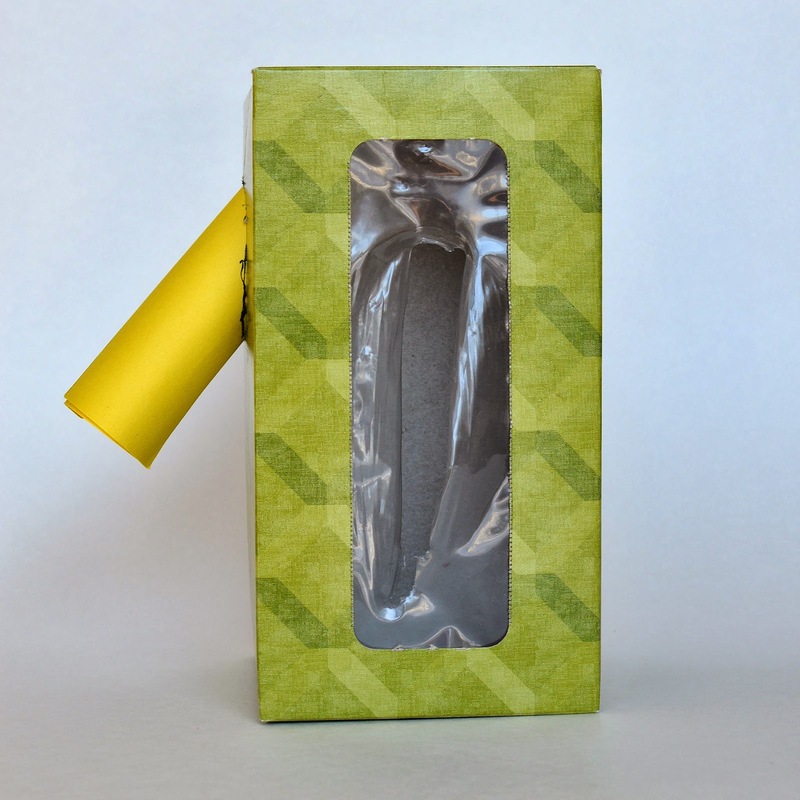 You are wonderful to share this information in manner which people will "get" I love the Kleenex box. That so works!!! I'm a self-taught beginner sewer. Thank you soo much for this post! You made everything so clear and obvious! I admit it, I had no idea ... I just made the sleeves that the pattern gave me and thought that I assembled something wrong when things didn't turn out how I expected. I understand now. Thank you. Along with some of the other folks who've commented, I am also a self-taught beginner. This was just perfect!! You did such a wonderful job of explaining the process, and it just made everything click and make sense! So far I've only been brave enough to sew for little ones, but you've inspired me to try and tackle an outfit for myself. Thank you for sharing your wisdom!! this article really fixed my 'sleeve theory'. Beautiful post! And so much information given in such easy instructions! God bless you! Just came across this post - it's so well done! I've saved the link. Nice job! I just found this today and am extremely grateful for this very clear presentation. Fantastic! How funny that this is actually a problem discussed by a pro. I have had to manipulate my sleeves for years. My body does not match anything I buy especially in the shoulders and it's why I like patterns. I have been changing sleeve shapes for years. Never knew others did the same. Many who sew say, "What are you doing???" I love this tut. WOW!!! Just found this, and you have made crystal clear a concept I have been struggling with for quite some time! How much I wish I could come just watch you draft patterns for a few days.... like so many others, I am totally self-taught, relying on books and the internet. I will never be able to go to fashion school and learn drafting; posts like yours are worth their weight in gold. I learned something new with this. I feel so satisfied with learning about the sleeve caps. I loved this post. Thank you. I feel like I could just go create a million well fitting tops with this new knowledge! Absolutely amazing for someone who has never 'gotten' sleeves - thank you! Thank you for taking the time to write this! It is very helpful and interesting to read. A friend shared this link with me so I look forward to seeing what else you have. Thank you, I've been struggling with sleeves since I started sewing, and I've started to suspect that it wasn't just the sleeves, but the whole armhole that was the problem. I'm also going to flatten the sleeve cap rather than just making everything bigger for my chubby arms. This is the most instructive information on drafting and fitting armscyes and sleeves that I have ever, ever seen. Awesome! I just found this post when American Duchess pinned it on Pinterest and I am so glad! Thank you!! Très bien ce tuto avec de super explications Merci beaucoup .Vous avez amenez beaucoup de réponses aux questions que je me posait sur les différentes formes de manches . Thak you so so so much !! Awesome, especially the Kleenex box. Five stars from me! What an awesome post, the best tutorial on sleeves I have ever read. I found you via Crab and Bee, I'm so glad I clicked on the link! Thank you for this very helpful explanation. There is one thing I don't understand, relating to the Kleenex box demonstration. 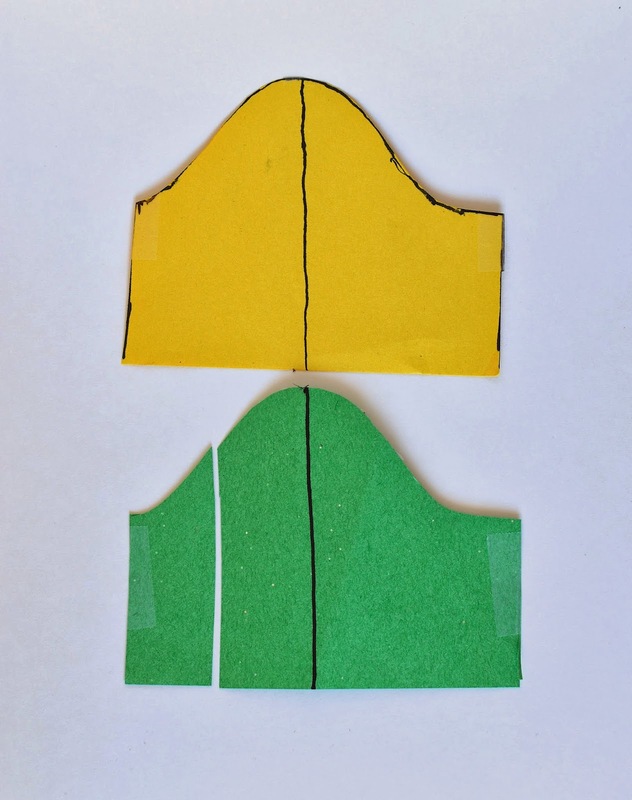 If the armhole size in the bodice is fixed (make it as small as possible) then the sleeve circumference in the angled-down case (yellow tube) will be quite small; obviously much smaller than the armpit circumference (simple trigonometry) and therefore potentially unwearable .... ? Anonymous: Exactly. Hence why the angled-down case is not preferable in drafts for normal-sized people who are planning to move at all in their garments. The possible exceptions are garments in which people want a sleek silhouette (e.g. knitwear), or formal wear in which people don't plan to raise their arms much (e.g. jackets), and really thin people with really skinny arms. Otherwise, on regular people with regular bodies, it can be, as you surmised, excruciatingly uncomfortable. Thanks so much for this post! I'm a self taught beginner and I'm trying to alter a button-down shirt (from L to M). I have a question though, if I opt to reshape the sleeve cap to a much flatter one instead of the pointy one, when I make my draft, am I allowed to shorten the height (distance from shoulder to armpit)? I noticed in your drawing that the much flatter sleeve cap no longer has the same height as the pointier sleeve cap. Thanks! Imp: Yes, the height of the sleeve cap, h, (i.e. the distance from to top of the sleeve to the armpit line) will be shorter. If this results in the curved sleeve cap length becoming too short to match your armhole circumference, you must either reduce the size of your armhole (if this is what you want) or else extend the curved sleeve cap length to match the bigger armhole. Imp: Personally, I've never made a sleeve whose total length was shorter than the height of the sleeve cap. No reason other than I don't enjoy wearing cap sleeves. 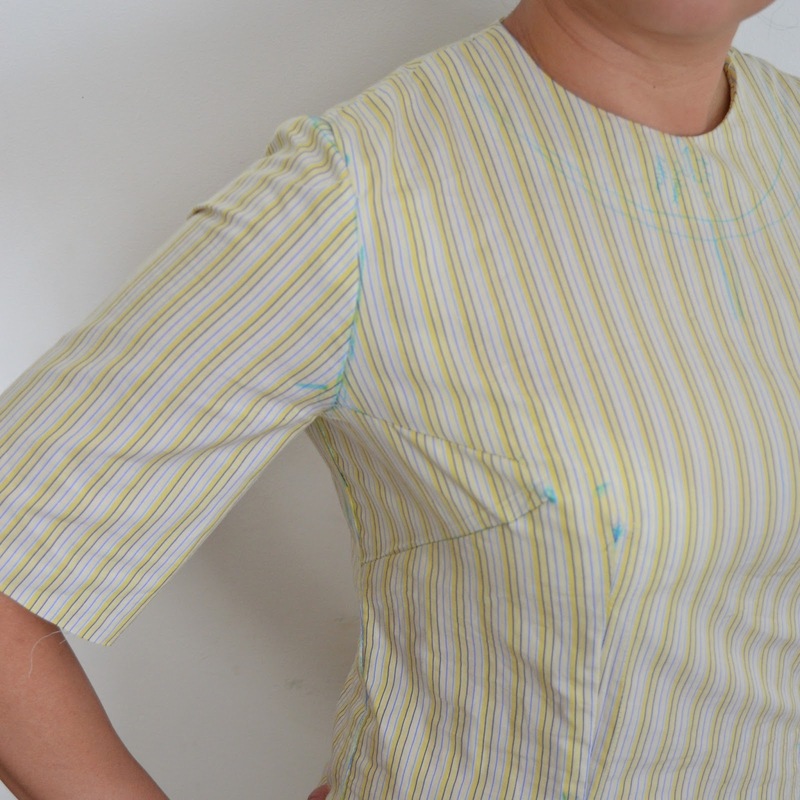 Go ahead and cut out a sleeve muslin and try it on to see how it looks and feels on you! Brilliant and now I understand the principles rather than the formulaic instructions I've found elsewhere. You just saved my sanity - I've bitten off more than was sensible for my skills, and on my 2nd muslin still struggling to sort the fit and with a week to finish a dress for my 50th birthday. Did I say thank you! This was brilliant and better...way way better than anything I have been taught about sleeves before. Thank you so much. An excellent article. I've come back to it a few times. I particularly value the argument that mis-fitting sleeves relates to a mis-shaped armscye. - Have you read Morris Campbell's thesis "The Development of a Hybrid System for Designing and Pattern Making In-Set Sleeves"? YES! A PhD thesis on setting in sleeves. Who woulda thunk it. Morris did. ...Being of a mathematical bent, I have been building a mesh of formulas to assist in drafting but determining the 'angle of set' and plotting for a particular angle has me a bit flumoxed. It is to do with the trigometric plane shift of the truncated cylinder. I'll get there! Beth Jennys: I am so happy that this post has helped you. I hope your blouse (and its sleeves) turns out beautifully! 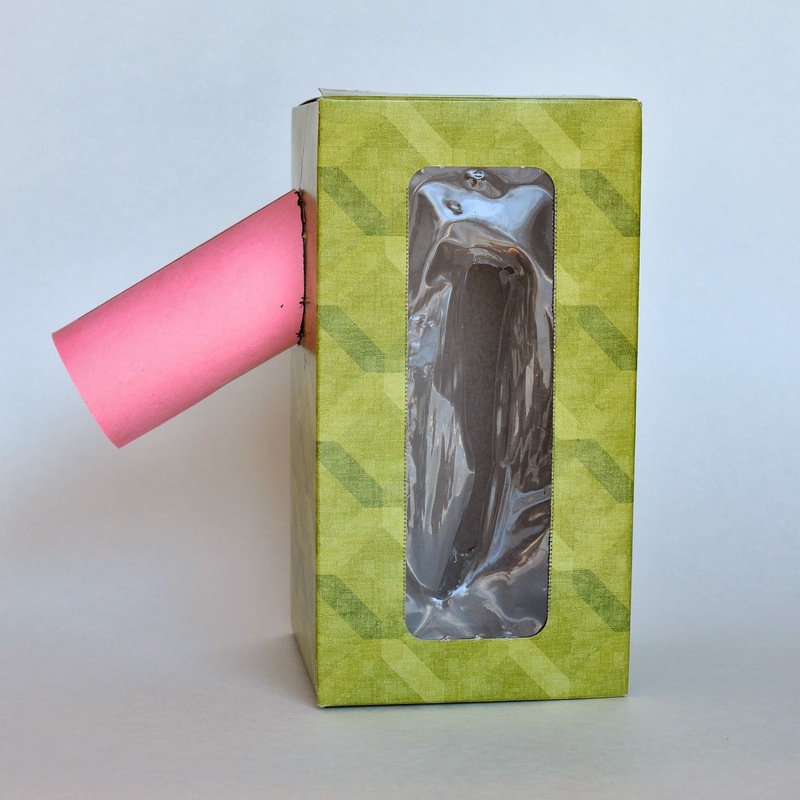 I was so confused about why sleeve caps take that bell shape, but that tissue box demonstration was GENIUS! This is just the best info. No book I know of has gone this deep into the science of armholes and sleeves. This is the first time that I have learned that the armhole is the first and most important step in getting a good sleeve. Good job! 1) If I want my sleeve/armhole to be more roomy, do I just increase the circumference of the armscye or can I lengthen the vertical length from the end point of my shoulder to below my armpit? (i.e go even lower the armpit) because I tend to find my fabric at the side bust area to pull into the armpit. Or is it just a matter of increasing bicep circumference? 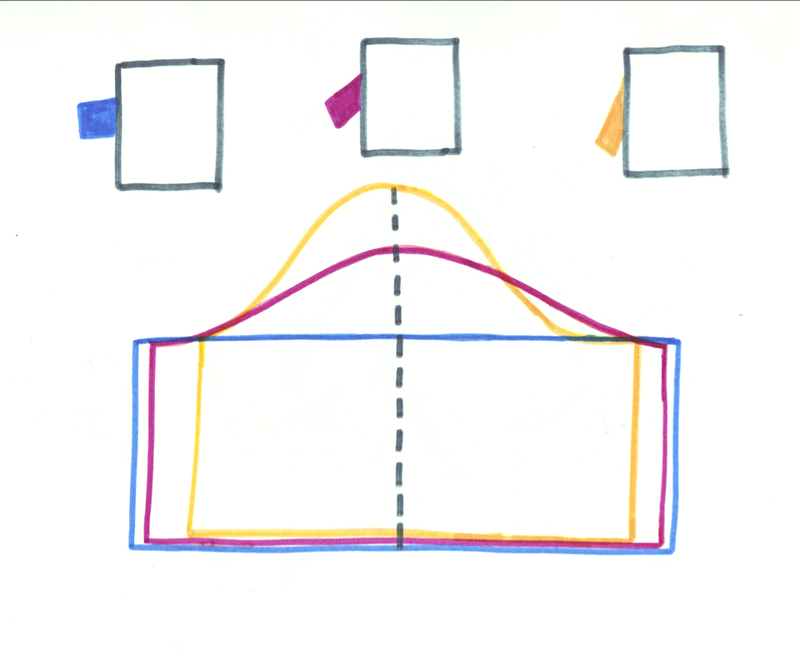 2)Must the front circumference of the cap slope always be longer than the back? Or is it ok for the front and back to be equal length? Actually I've seen one tutotial online that says the back is longer than the front (but that's cos the back shoulder seam is more forward. I really appreciate your clarifying my queries! 1) One is related to the other. Significantly increasing the circumference of the armscye means drawing a bigger "oval", meaning the axis of the ovals will have to lengthen, meaning the armpit point drops lower. The converse is true. You can also increase the armscye circumference by cutting the front/back armscye curve deeper which may not affect that armpit point. It really depends on the shape of your upper arm - without a photo, it's hard to suggest which area to adjust. I would generally put a dart in the side bust area first, before ever enlarging an armscye. Re: bicep circumference. If your sleeve is tight even when your arm is hanging by your side, you'll probably need to increase the bicep circumference. 2 Not always. In people who slouch/hunch/have medical conditions that result in pronounced back curvatures, the back armscye length is often longer than the front. Sometimes, in loose garments (e.g. a loose-fit Tshirt), the back and front armscyes are cut exactly the same length i.e. the sleeve is symmetrical, because the extra ease in that area nullifies the need for a precise fit. Very useful. Thank you for sharing. Going to try it out soon. I'm so happy to have found this post! But I still have one questions. I'm making fitted sleeves with an S shape shoulder cap. I flattened the sleeve head like you proposed in the post and I have great mobility in raising my arms and putting my arms. The only thing is that when I cross my arms forwards, it's really tight. Do you have any tips on fixing that? Thanks in advance for you answer! geneb181 - without seeing the sleeve draft or your particular shoulder/arm, I can at best guess what the problem might be, and suggest a solution based on principle only, but let's hope it will help! The S-shape cap sounds as if the sleeve has its seamline somewhere other than the bottom (i.e. it is not a continuous line with the side seam of the bodice) - perhaps at the back of the arm, for instance. 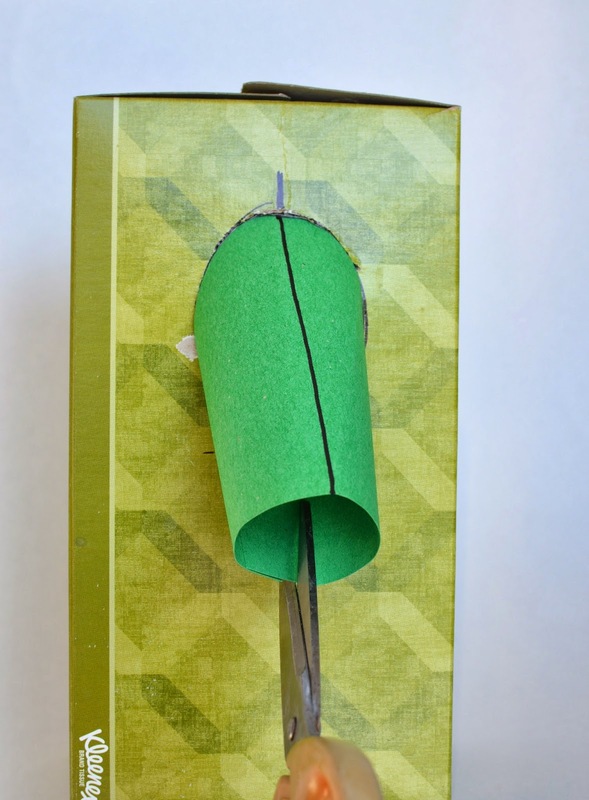 Hopefully you will have cut it apart (like the green and yellow illustration at the end of this post) and reassembled it to look like a regular bell-shaped sleeve cap. This is not always necessary, particularly if you have a fair bit of experience in drafting. However, it is helpful to make adjustments on the bell-shaped sleeve cap because it is easier to visualize how each change affects the fit on the body (or in this case, your upper arm). Once you have the bell-shaped version of your sleeve cap, you can adjust its shape according to the earlier part of this post. If the sleeve is still tight, as you've said, it could be a bodice or armhole issue rather than a sleeve issue. The chest could be too tight, for instance. Or the armhole is too large, or cut too deep, so that there is less bodice fabric in the upper back area (a deep or oversize armhole removes fabric in this area). You will possibly have to redraft that armhole and/or the chest width on the pattern. I hope this is a helpful starting point for getting your pattern to fit more comfortably. This is a really useful post! Thank you so much. 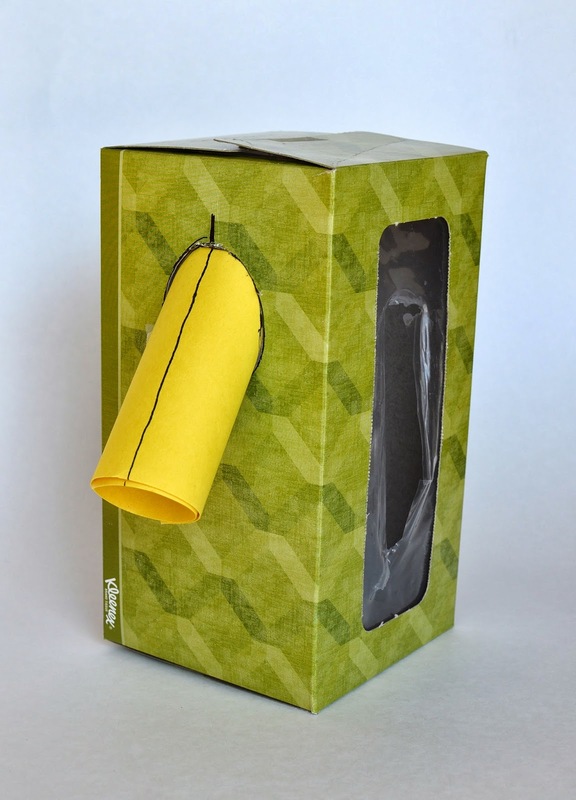 I have seen this phenomena described in different ways, but I have to say that the kleenex box is brilliant visual explanation. Thank you! Thank you, thank you, thank you! I really needed this today! I free-hand design my patterns, and I get decent armholes instinctually, but I never felt comfortable drafting a sleeve until now. Amazing! Excellent article and you should write a book! Never have a I ever seen an explanation on this and I have such issues with patterns never fitting my biceps. It was so easy to follow and understand. Just a question though, if I need to dart around areas of the armhole due to excess fabric, can I pivot this dart to another area. ( I don't like the appearance of darts in areas of the armhole). Thank you for this explanation and sharing it with us all. I love the Kleenex box explanation. It gave me a better of understanding of how sleeves fit. I am currently teaching myself to sew and all these wonderful explanations shared by people like you are moving me along my journey. Wow. I learned so much! Also love your writing style! The only thing left with a lot of question marks is the inflection point of the sleeve cap: How do I identify it on a pattern where it is not indicated? Mimi: An inflection point is where the gradient or curvature changes. So my question is: Is there no more strategic way to find the exact inflection point than just eyeballing? I imagine aligning a curved ruler helps in order to see where the sleeve cap starts curving in the opposite direction, but even then… how can I be sure the inflection point is where I think it is, and not one centimetre to the right or left? Are you kidding me?! Thank you so much! I've really been struggling with fitting and this is a great post! Wowee - incredible - I wish you lived next door to me - lol!!! For many years I have struggled with the puffiness of the sleeves in so many regular patterns - they just don't look right. Your comprehensive explanation makes so much sense - looking forward to altering my sleeves accordingly! Thank you so much. It is the first time I understand where the sharp of the top of the sleeve come from!!! I have been sewing for my family for forty years but this is the first time I've understood how sleeves really work. Never had trouble with standard sizes but have lately been gnashing my teeth over trying to fit sleeves for a short, chunky girl with narrow shoulders, wide neck and very big arms. You have saved me! Thank you. Fitting very large but small-framed, short women is a nightmare. Everything which goes AROUND is far too LONG in body, sleeves, legs, etc and gapes or pulls in all the wrong places. I'll check out more of your site. Thanks again. Sujoy. I have been sewing for my family for 40 years and never really understood how sleeves actually 'work'. Biggest problem is sleeves for a short, chunky girl with big arms/neck but narrow shoulders. Everything which fits circumference of arms/body is not only way too long everywhere but worse, gapes or pulls in all the wrong places. So hard sewing for this shape without drowning poor girl in fabric or dooming her to mumsy knits. We need more good patterns for short, chunky women who want to be stylish. Thanks so much for this really helpful explanation. "You have saaaaved meeee." I'll check out more of your site for sure! I have to thank you for this. I've always understood the basics of how a sleeve works...sort of. Every other explanation I've found seems to leave stuff out that's seemingly obvious to everyone but me. Between this post, and your guest post about the sleeve drafting itself, I managed to draft the sleeve and arm scythe right the first time. I was so shocked at how easily the sleeve set in I was sure I was messing it up enormously all the way up until I test fit it all sewn together. My neckline still needs work, and I won't call the sleeve fit perfect, but for my novice levels of skill I'm incredibly excited I managed to do this. Thank you so much, I can't tell you how much this helped me! I am a super beginner and I have been struggling with the holes in pattern drafting. I have followed your sloper tutorial and I am trying it out today. I AM OFFICIALLY YOUR STUDENT. thank you for such tremendous effort. I really love your tutorials. It make sense. Thank you so much I cant thank you enough. This is a great piece. I've been having problems with sleeves so much so that I almost lost interest in sewing. The Kleenex box demo is very helpful. I'd like to share this in my FB groups so that more people will benefit from it. Thank you Karen, you are such an angel. Hi, I hope you will still read this in 2017. So a marvelous armscye is a small one, i assume close to the shoulders and the armpit. But what if I want my sleeve to drop lower from the armpit. I do not like to feel the sleeve seam and side seam under my armpit when i rest my arms down my side. At the moment I measured a comfortably fit garment I have, it's vertical measurement from the shoulder seam down to the armpit seam is 9 inches. As this seems pretty large, I have to draft my cap height taller (about 6.5 inches) to draft an armscye length to fit the bodice without the bicep measurement going over 16 inches. Any help in this area? Unknown: without actually seeing your garment and your arm in its particular armscye, the best I can do is guess. That said, a small armscye fits better for a garment that's overall fitted. If your garment has a roomy fit (e.g. a drapey blouse or a comfortable shirt), a larger armscye and larger sleeve make sense. Thank you! I feel much less afraid of altering my armscyes now that I understand more! Life changing! I thought I knew a little about sleeves, but then I read this. I now know that what I thought I knew was a thimble full compared to the ocean and that quite a bit of my knowledge was incorrect. This post is invaluable. Thank you very much for what must have been a boatload of time and thought on your part. It is greatly appreciated. Fantastic post. Thank you so much for a wonderfully straightforward, brilliantly informative explanation. I have spent the last week wondering how to tackle the fit issues I was having with a jersey cardigan and now I finally know where to start. So glad a fellow forum member pointed me here. I'm pretty early on in my pattern-drafting adventure but have jumped straight in with ballroom competition dresses (needs must :o). I'm trying to draft sleeve for lycra with loads of mobility that will fit close into the armpit so you can't see a void space between arm and sleeve with sheer stretch fabrics when the arm is raised up. but what do I do to ensure the underarm section of the sleeve is body hugging throughout the sphere of movement? Curve the very top section of the underarm seam perhaps? Re: that void space in the armpit under the arm: you know, I've seen leotards that still have those void spaces (assuming that the void space I'm imagining is the same void space you meant). And leotards are as form-fitting as they come. I'm not sure we can completely avoid that space; as long as the sleeve is attached to the armscye, it's going to pull the fabric along with it. The only thing I can think of is to raise the armscye as high as it will go. This takes away fabric from the sleeve that would otherwise be sagging into a lower armscye. And I'd make the bodice as form-fitting around the bust as the wearer's contours allow. This might mean seaming the bodice with integrated darts (i.e. integrated into seams) to fit that bust/armpit area as closely as possible. That said, I've also seen armpit seam-junctions (and crotch junctions) made with a triangular godet-type piece of fabric so that the actual junction point is that flat triangle rather than a seam that pulls into a void space. Would that work for your garment? This question might be a 'layer' thing, but in reducing the circumference do you really put a dart in the front and/or back of the armscye and then leave it there? Could either of those darts be thrown to a neck dart or the bust dart? The gaps at the front and back of the armscye are fitting issues in and of themselves that need to be addressed; I just wouldn't want to fix them by having darts all over the place. Any suggestions? I am a beginner at all this. NOTHING comes intuitively to me so the whole Kleenex box demo was awesome!! First I have seen your site. I will surely come back for more! I LOVE the floral stretch T BTW. Nice work! Longer answer: Ideally, I would not work with a bodice that already has a too-large armhole. I would instead redraft the entire bodice so that the armhole is the correct (smaller) shape. Working with an ill-fitting commercial pattern, however, is a little bit like working the fitting process in reverse, in which case we would have to insert the dart into the armscye IF the area to the side of the bust is indeed where the superfluous ease exists AND it is where that ease is most effectively taken in. That said, yes, by all mens shift that dart to the neck or shoulder or any other area, if the existing design of the pattern allows it. For instance, unpick the entire shoulder seam, and change the FRONT shoulder slope to incorporate the effect of that front armscye dart, then sew the new front shoulder to the original back shoulder in a new shoulder seam. That way you wouldn't have had to introduce any visible darting at all. Incidentally, I have personally added bust darts to the front armscyes of many of my own RTW garments (never the back, because my fit issues did not extend there). I am happy to report that they were not as obvious as they might sound, and the improvement in fit far, far outweighed the slight undesirable change to the aesthetics of the garment. Thank you LiEr. Have you ever considered writing a book or giving classes? I made a rather flat sleeve cap because I'm working on a ballroom costume, which means lots of arm movement. It's a 4-way fine stretch net. I followed the directions for keeping the circumference consistent so that it fits the armscye. Sadly, I'm seeing diagonal drag lines sort of on the underside of the sleeve, toward the shoulder. I'm reading everywhere that the solution is to raise the sleeve cap... But that would mean restricting arm movement and ending up back where I started. Is there a way to fix the drag lines without increasing cap height? I've tried pinning the armscye so that it's higher under the arm but that didn't work. Hello Anonymous: please write me an email so I have an email address to write back to. I might be able to help with a sketch. Extremely informative post! All those little nuances we take for granted, and ignore while trying in vain to achieve a good fit🙄....very well tackled and explained. Thank you for this! I am new to drafting my own garments and have been working trial and error with the armscye and the sleeve cap drafting. My conclusion b4 I read your post was that I would stop putting in ease. But your instructions are so so helpful to understand how the mariage of the armscye and the sleeve really work for different effects. So I am going back to my drafting table to apply this new knowledge. Thanks a million. You are very generous and it is much appreciated. Question : For a casual boyfriend's shirt look, how much longer would you make the bodice's armsyce at the side seam and at the shoulder. And would you keep the same slopes (shoulder, front and back slopes from notches to shoulder seam) ? Terri, I am so glad this post helped you! Thank you for your kind words. To answer your Q: I don't work in absolute numbers, especially not having seen the person for whom this shirt is being drafted. I'd say you should keep the shoulder width as close to the actual measurement as is comfortable - too wide and it might look a couple sizes too big for that person. Perhaps find a shirt whose shoulder width you like and match that. When I decide on the size of the armhole, I usually take a tape measure and loop it around the person's shoulder, letting the loop hang as low or as high under the armpit as I feel would be comfortable for the wearer. I use that circumference measurement (not the vertical distance per se) and draft the armhole accordingly, then the sleeve cap to match that. It is a more common-sense visual of the actual fit than a "vertical drop" from the shoulder, which in itself has no significance because the former takes into account the 3D thickness of the wearer's upper arm and other real contours. I just re-read your article. I got my bodice sloper right the second time and incorporated a better fitting armscye based on the idea that an armhole should be as close fitting as possible (I absolutley agree). I am on to my sleeve sloper. Re-reading your article gave me direction I need. I was discouraged at the fit of commercial patterns and now I have solutions--or I can chuck it all and do my own thing. Thank you for that! I am making a woven dress. FBA, and a large bicep (16.5" plus the ease makes it 18.5 --so, yup large) the FBA adjustment already added to the side of the bust, and now to make the sleeves fit I have had to add in more, which makes the whole underarm baggy and "stinky"
Claire: without seeing the sleeve/armhole in person, I can't visualize what the issue might be. It could be the fabric (woven has no give in general) that's contributing to the inability to move your arms within a closely-fitted sleeve, but it can't be the only factor. If you're willing to take some photos and email them to me (my email address is in the blog sidebar) I might be able to get a better idea. My friend also needs a bicep measurement of 18.5" but I had just very proudly achieved a nicely-fitted armscye which measures 20". So I basically found I would have to make the sleeve cap almost completely flat, only adding 1.5" extra in 'curve length' to fit the armscye, or else end up with a ridiculous amount of ease in the cap. I'm just not sure a kimono-type sleeve is what I was after. I appreciate that everyone's fit issues are slightly different, but Lorraine, if you do come up with a solution for Claire, I'd be really interested to hear if there are any principles I can apply for my friend's dress too. It sounds like we've both got to a similar point for similar reasons, and it might just save me a few muslins-worth of trial and error! Hello Claire, Hannah and Lilith! I was on vacation during this comment thread and I apologize for my late reply. My thoughts are along Lilith's in her most recent comment (#167). A well-fitted armhole is really the result of a suitable balance of armhole circumference, bicep width and shape of sleeve cap. The armhole size is typically the first thing to get right, after which the other factors will need be tweaked only a little. However, if the armhole size is way off (either too large or too small), tweaking the other factors - or even greatly adjusting them - may not help much. I'm sorry this isn't more immediately helpful; sometimes it's hard to say which particular factor needs to be adjusted most (or first) without looking at the garment on the actual wearer. This is excellent, thank you. I am drafting a sleeve for a knit shirt I love, but I hate the cap sleeves. The tissue box visual helped me understand how to pin tissue to my mannequin under the shirt on the form to successfully draft a 3/4 length sleeve. There's too many comments to read, so I apologize if this has already come up, but I have a new problem. Fitting my muslin with a high cap sleeve gave me the same as the photo with "too much cap height", but when I made a flatter sleeve head, it became tighter around my bicep and created drag lines from the elbow to the armpit. The only measurement that changed was the sleeve cap. Is there some other adjustment needed whenever you change the sleeve height that no one talks about? Sarah Marie: without seeing your actual draft, my answer will be a guess at best, so I apologize beforehand if I'm unwittingly suggesting something opposite to what has actually happened. When you made the flatter sleeve cap, did you simply "chop off" the pointy peak of the sleeve cap i.e. "blunt"-ing it? If so, you might have reduced the curved length of the sleeve cap (i.e. the edge that gets sewn to the armhole). Drafting a flatter sleeve cap for the same armhole means re-drawing an entirely different sleeve cap shape while keeping the same curved sleeve cap distance. In order to do this, the bicep width (i.e. which is related to the straight width of the sleeve cap at its widest place) must increase. So you should in theory get a looser sleeve in the bicep area. If anything, this will result in some fabric pooling in the armpit area when your arm is tight against your body. You should not be getting a tighter bicep or drag lines from the tightness. Hope this helps. Thanks for your advice. I think what I did was I read your article after making my first sleeve and it had a higher cap with a little bit of ease. When I read your article and you said that the cap curve is to be the same measurement as the armhole, when I changed the curve to a flatter one, it took care of that ease so I thought it would work out great. I guess a general question for me to ask would be: is it impossible to have a more fitted sleeve that works well for both the sleeve head and the sleeve body when the final product is to be comfortable for movement? I'm just getting back into the game after years of being out of school (I also distinctly remember our teacher being so uninterested in teaching the class that she was miserable and we didn't learn much, so I apologize for my ignorance). My final fabric is going to be more like sweater material, but I wanted it to fit with my curves, so I've done a loose mockup with muslin. I know it's not going to fit exactly the same, but I didn't want to go through a bunch of expensive fabric with the learning process. I was hoping to have a comfortable, sleak sleeve without it being baggy. If you suggest a higher sleeve cap for knits, then I don't understand why t-shirts are made with a flat one???? Again, sorry I'm so stupid with this, I feel a little embarrassed. I really appreciate your help though and that you actually responded! I wish I could show you a picture, but I'm terrible with technology! Sarah Marie: Not stupid, my friend; never a stupid question whenever you're learning or re-learning something. Remember that it takes a certain level of awareness and astuteness to even be able to have a question to ask about something. I am happy to (try to) answer! T -shirts are all kinds: the sort I visualized when I wrote this post were the baggy straight-cut unfitted unisex kinds that are meant for many different body shapes. These days there are so many other kinds of garments that are categorized as "T-shirts", including the more fitted women's knitted tops that are shapely and have ease in the bust and no ease in the waist. Like the blue floral thing I photographed myself wearing in this post. Both kinds just happened to be made with knit fabric i.e. non-wovens. Both have some kind of give to the fabric, but unisex-Tshirt fabric is far less stretchy than the typical knit fabric used for those fitted women's tops. I'd say that if you were making a knitted top with sweater-style fabric or any kind of 2- or 4-way stretch, you have a lot of flexibility to draft a pointier, sleeker sleeve cap. When I first read your question last night, I immediately visualized a woven fabric like quilting cotton, for which a tight bicep would've been torture to endure in a sleeve. In a stretchy knit, though, it might not be. And you're right - a sleeker sleeve in a stretchy knit would look nicer and still allow a fair bit of freedom of movement. Think spandex leotards, for instance. Pointy sleeve heads and neat armpits but so much (comfortable) arm acrobatics! Thank you so much for your help! I'll keep experimenting keeping your advice in mind. Happy sewing! 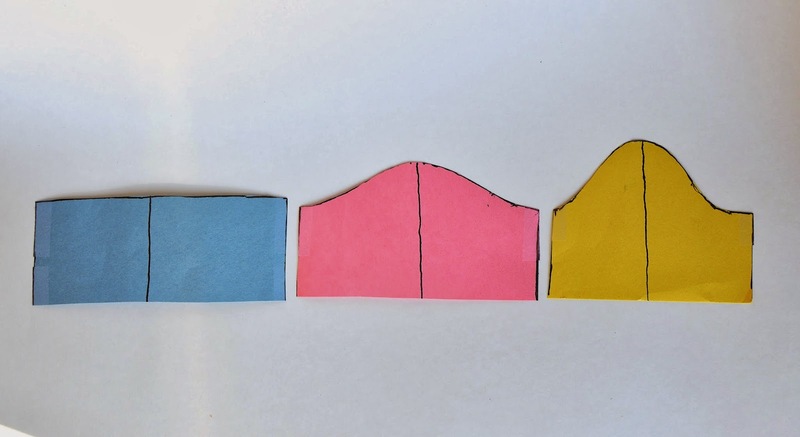 Is there a special method or different math for drawing different shapes of sleeve caps? Many of the tutorials I have found seem to be for the more tightly angled sleeve cap, and I would like to find one for the roomier, less angled kind. bonster: if there is a mathematical method that results in a flatter vs. sharper shape, I am not aware of it, sadly. I have always chosen my sleeve cap shapes (i.e. the flatness or sharpness thereof) by "feel". Many drafting people like the security of having a numerical method but I suspect in real-world drafting, people freehand curves and such a lot more than use geometry and formulae. It's initially intimidating, but give it a shot and make a muslin to see what that free-handed flatter curve looks like as an actual sleeve. You might be surprised at how un-difficult it is to see a correlation between what you drew and how that fits. 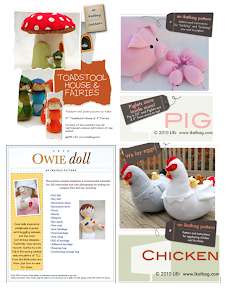 Catch my Flat Bunnies on Sew Mama Sew!